The Surya Siddhantha's version of the Epicyclic motion of the inferior planets. Unlike the Greeks, the Hindus focused on the ecliptic longitude of the planets and ignored their actual (varying) distance from the Earth. In the case of the inferior planets, the Surya Siddhantha focuses on the libration of the planets around the sun, i.e. on how their ecliptic longitudes lead and trail behind that of the Sun , manifesting as Morning and Evening Stars respectively. The Surya Siddhantha does this by projecting the real position of the planet on to the ecliptic (thus ignoring the distance from the Earth to the planet) to locate the ecliptic longitude of the planet. It then assumes that ecliptic longitude to be the "true" position of the planet. The Surya Siddhantha's mathematical model envisages two points Shigroccha and Mandoccha as housing two deities who pull on the planet with cords of air. The combined effect of these pulls makes the planet librate around the Earth. Mandoccha (Manda Uccha - the peak of slowest motion) is positioned at the inferior conjunction of the planet and the Sun as observed from the Earth. In reality, when the planet is at this point, it orbits the Sun in the same direction as Earth orbits the Sun. Hence the relative velocity of the planet as observed from the earth is the slowest at this point. 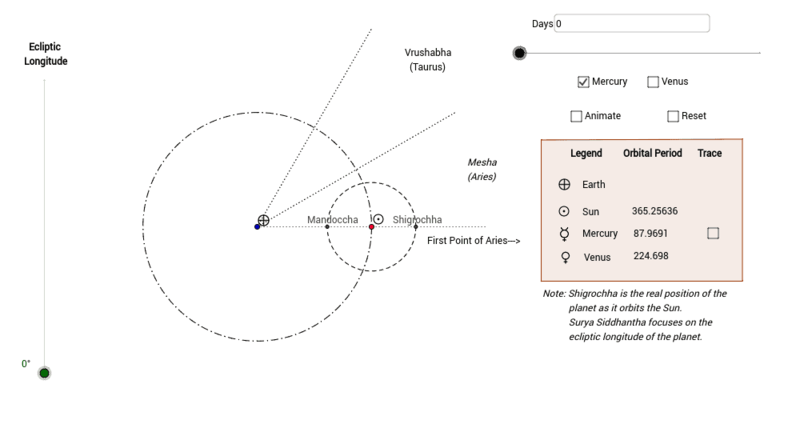 Shigroccha (Shigra Uccha - the extremity of fastest motion) should be positioned at the inferior conjunction of the planet and the Sun as observed from the Earth. In reality, when the planet is at this point, it orbits the Sun in the same direction as Earth orbits the Sun. Hence the relative velocity of the planet as observed from the earth is the slowest at this point. In the case of the inferior planets, this definition is altered; the shigroccha it is modeled as orbiting the Sun the way the plant really orbits the Sun (i.e. the epicycle). The Surya Siddhantha also recognizes the retrograde movement of the planets on their geocentric orbits caused by their epicyclic motion. This movement is illustrated by the Ecliptical Longitude slider. By turning the trace on, this retro movement can be seen to coincide with the "looping" of the geocentric orbits of the planets. Note: On the Zodiac, Taurus trails Aries which trails Pisces and so on. This means that on any given day, Pisces rises in the East above the horizon before Aries which in turn rises before Taurus and so on. Correspondingly Pisces sets in the West followed by Aries followed by Taurus. On Day 100, will Venus be a Morning Star or an Evening Star? What about Mercury on the same day? On Day 400, will Venus be a Morning Star or an Evening Star? What about Mercury on the same day?